The number one reason gift cards go unused is because people forget to use their gift cards. Here are several minimalist wallets that can help you keep your plastic gift cards top of mind. 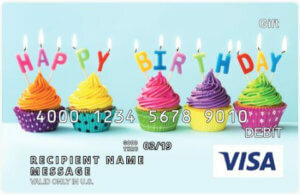 Tired of carrying plastic gift cards? 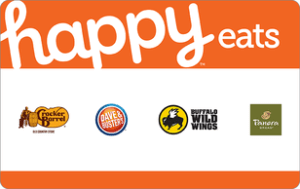 Buy eGift Cards. As easy to send as they are to spend. I’ve been writing this Gift Card Girlfriend blog for nearly 10 years now. In that time, I’ve only allowed a handful of guest bloggers to add content on my behalf. I’ve kept the gates locked for a variety of reasons, but the most important one is that I’m so passionate about gift cards that rarely does anyone offer a gift card point of view I haven’t already written about. But when I started working with students from the BYU Marriott School of Business Experiential Learning Project, everything changed. The younger “Millennial” or “Gen Z” perspective of the interns has created new dialog that I’m happy to share. 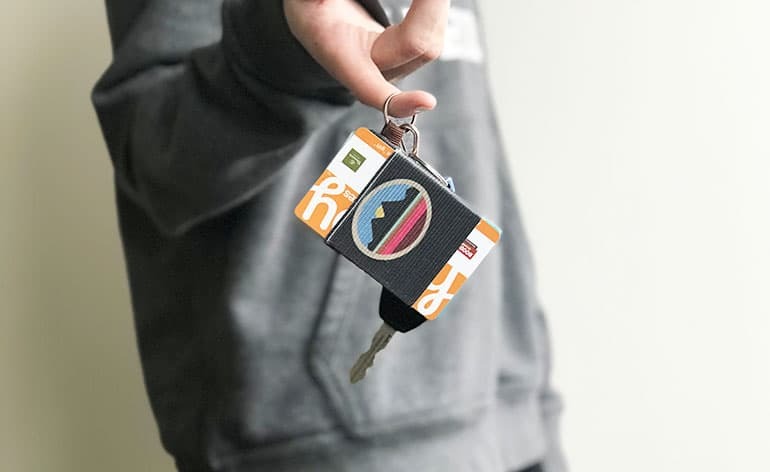 Ashley Ellsworth, a Communications Major at BYU, showed me how extensively college students use minimalist wallets–the kind that keep only the most essential cards handy! I wondered what challenges that creates for keeping plastic gift cards top of mind and ready to redeem. In this guest post below, Ashley shares her favorite minimalist wallets for holding plastic gift cards. What Wallets Do College Students Use and Where Do They Keep Their Gift Cards? Who doesn’t love free things? I think we all can agree that receiving gift cards is generally highly appreciated. However, there are certain drawbacks. For many people, storing gift cards can get messy. It’s never any fun to pull out your wallet in front of a cashier only to realize that your gift card is somewhere on your desk. Or did you leave it in your purse? Maybe it’s in your coat pocket from the last time you went shopping. Long story short: keeping up with your gift cards is a hassle. Thanks to the world wide web though, I’ve found a few potential solutions to this gift card dilemma. 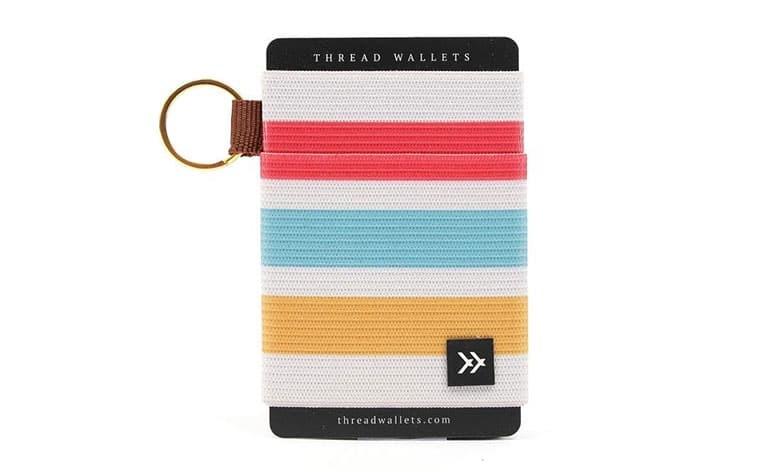 With its gaining popularity, Thread Wallets offer a whole new twist on storing all types of cards. 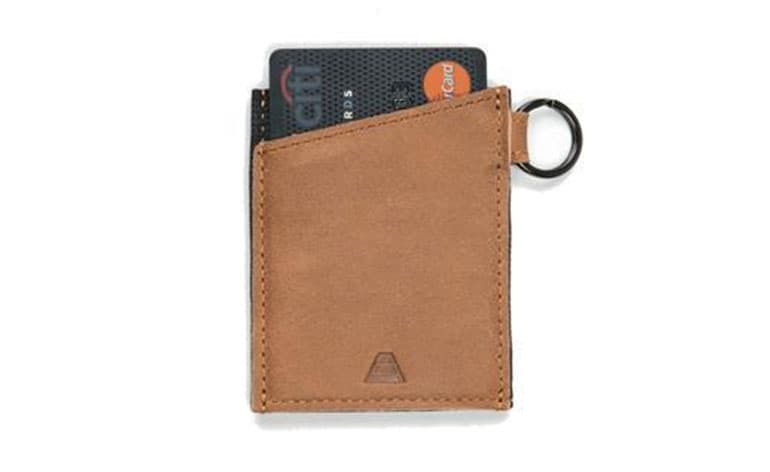 These small wallets attach to your lanyard, so wherever your keys go, your cards go too. They can hold around 12 cards, but without the hassle of lugging around a wallet. I’ve talked to several people about the reasons why people love Thread Wallets. For starters, they come in many different designs! They have something for everyone. They also are heavy duty. I was expecting to have to buy a new one every few months or so since they are carried around everywhere, but I’ve used the same one since 2015! But the biggest benefit is that you don’t have to worry about bringing along with you a big wallet. You can find them at ThreadWallets.com. If you don’t take your keys with you everywhere you go, need no fear. Phone cases with storage for cards may be a better fit for you. You simply slide your cards into a little pouch in the back of your phone. You’ll forget that they’re even there. 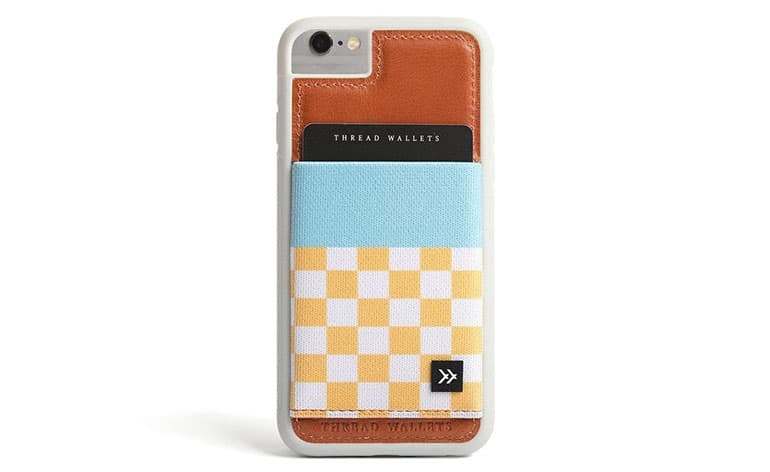 Phone case wallets can also be found on ThreadWallets.com and Amazon.com. The keychain wallet with elastic can be found on ThreadWallets.com vertical wallets and you’ll find a nice leather keychain wallet on Andar Wallets as well. While most college students avoid carrying a full wallet or purse, many of us are lugging around backpacks throughout the day. To keep track of gift cards, select an interior pocket in your backpack and throw all your cards in it. Or get a business card case, put your gift cards in it, and keep the case in your car or the bottom of your backpack. The gift cards will be less visible to you, but you’ll always know where to look when you need to use one. 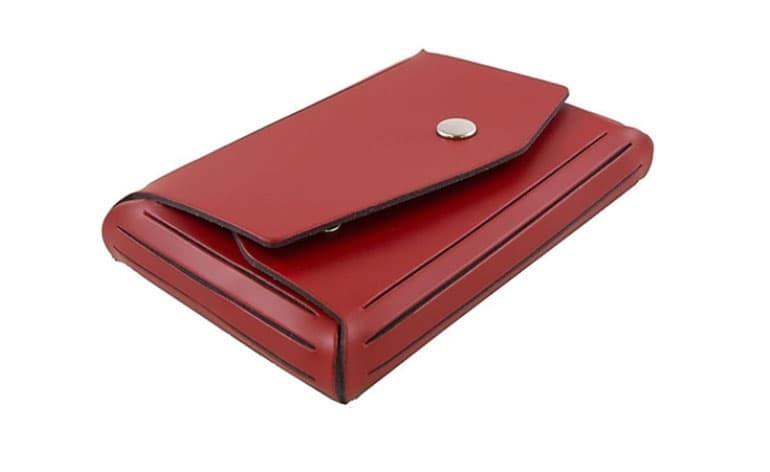 This business card case and many others can be found on JAM Paper & Envelope or by searching for “business card case” on any office supply website. 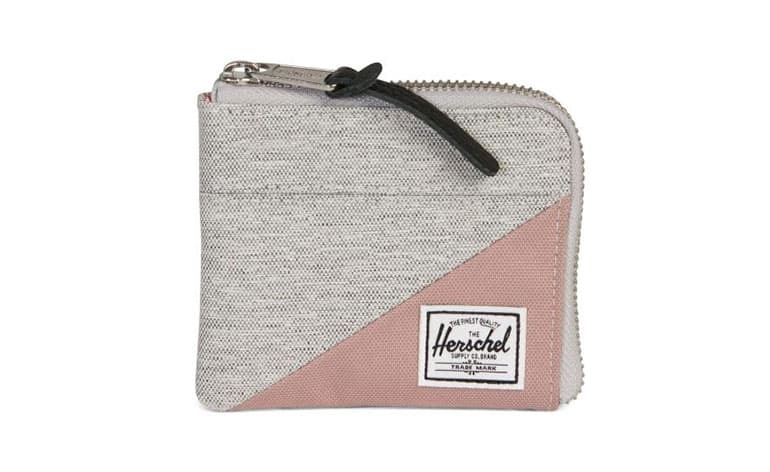 Find this coin wallet at Herschel. The biggest downside to minimalist wallets: you normally cannot fit very many cards in these little cases. But here are a few suggestions to help you overcome this issue and keep your gift cards ready to use. Create a Gift Card Space. Store additional gift cards in the same place at home so that you can easily find them to take with you when shopping. Don’t stash gift cards all over the house, leave them in greeting cards or tucked away in drawers where you will forget you have them. Pick a place, put every gift card you own in that one location, and check it every time you leave the house. Hole Punch Gift Cards. Hole-punch the sides of gift cards and put them all on one ring. 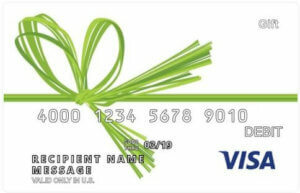 Just make sure not to cut through the magnetic stripe on the back of the card or any of the gift card numbers. Keep this key ring full of cards in your car or backpack so they are always readily available. It might be a little work to get organized like this, but there is also a good chance you will be shocked at the amount of money you still have left to use once you get your cards all in one place! And here’s a tip! If you’re really on top of it and set to organize your life, try writing the remaining balance of the gift card directly on the card. A permanent marker is all you need to get the job done. Doing this may seem tedious at first, but it will save you time in the long run because you’ll always know how much you have to spend. Organization is key to getting the maximum use out of gift cards. If they’re just laying around the house, you may forget you have them, forget to use them, or accidentally toss one out. Don’t let that happen. Us college students can’t afford to waste even a dime! Thanks for sending these tips Ashley! My teenage daughter has a Thread Wallet and all her friends do as well. I’m not kidding. Every girl who walks into our home is carrying a lanyard with a fat elastic full of plastic. I just hadn’t considered the gift card angle because minimalist wallets seem so impractical to me. I have so many cards I need to keep handy–debit card, credit card, medical insurance card, dental insurance card, driver’s license, Target Red Card (Hello 5% Off! ), Costco card and more. But I’m a mom and that’s my life. I enjoyed peeking inside the lives of these young interns and will be more mindful of how they can keep their uncluttered ways while still getting the full value of their gift cards. And while on the subject of clearing the clutter, check out my latest free workbook: Tidy Up Your Gift Cards Before it’s Too Late! If you have questions about other ways to keep track of your gift cards or need gift card help in general, let me know in the comments below or reach out to me on Twitter (@GCGirlfriend) or Instagram (@Gift.Card.Girlfriend). Ashley Ellsworth is a Communications student at Brigham Young University. She is pursuing a path in Public Relations. She loves looking at new perspectives and is a dedicated friend to the people around her. Can Gift Codes be Used in Stores instead of Plastic? 6 Ways to Make OPENING Gift Cards More FUN! Gift cards are fun to spend, but the "opening" part can be a little lackluster. 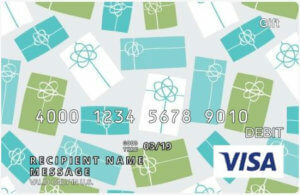 Try these fun ways to get a reaction out of your next gift card recipient. Read More » about 6 Ways to Make OPENING Gift Cards More FUN!